"I never thought I could get so many stars in my band! Do you realize how many years of experience and kilos of cocaine we're talking about?" jokes Carrot Top Records recording artist Megan Reilly on her band members, Two Dollar Guitar front man and Cat Power alum Tim Foljahn (lead guitarist for Reilly's band), Tony Maimone from Pere Ubu on the bass, and Steve Goulding (of The Mekons fame) on drums. Great tunes and good luck had everything to do with Reilly's fortune. 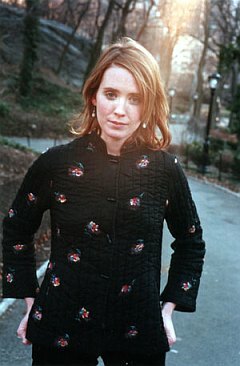 The New York-by-way-of-Memphis-based singer-songwriter ("It was part of a great escape plan. Exit fast or live the same life for what would certainly feel like thousands of years," Reilly says of the move) got her first break when Doug Easley took here into his Memphis-based studio, Easley Studios, and recorded a 45 with her. Seeing massive potential, he invited her back to do a 4-song demo. With demo in tow, Reilly moved to New York in 1999. The demo found its way into Sonic Youth drummer Steve Shelley's hands, who started booking her first New York shows. "I jumped up and down and screamed really loud! It was proof I'd done the right thing," Reilly says of Shelley's help. "Steve is great and his advice and support was invaluable to me. He told me how he went form working some crummy job to touring Russia with Sonic Youth in a day and that anything is possible. Sort of like, 'if it happened to me--'". From there, her band started to materialize. "[Folijahn] said no at first," admits Reilly. "He hates it when I tell this story. "It was a SLR show at Tonic, actually the same one that landed Steve Goulding, and my friend Chris Lee was playing guitar with me. I asked Tim and he said, 'you already have a guitarist.' So I bugged him for a month and he gave in. I mean, the fact that I had worked closely with Doug was sort of enough incentive for Tim. I know he holds Easley Studio in high regard. He worked there with Townes Van Zant right before he died." "I'm more comfortable around them than anyone I've ever played with," Reilly says of her band mates. "They're really supportive and it's the first time I have played with people that understand without explanation. These guys definitely deserve to have attitudes. But they don't. They've really become like my surrogate grandfathers. Uh, I mean uncles. Ok, big brothers." 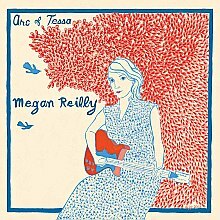 With her supporting cast, and their collective experience, Reilly and company went into Eric Morrison's The Devil's Isle Wet Lab to record Arc of Tessa, Reilly's debut full-length. "Eric's studio wasn't Easley," Reilly says without any regrets. "But it is in the country and it was great to drive an hour north every weekend for three months, listening to the tapes during the week and gathering my thoughts." Reilly couldn't be happier with her debut. "Of course I like every song," proclaims Reilly. "I can only say that it was made on a shoestring budget and sounds like pure gold." Once Arc of Tessa was recorded, Reilly was introduced to Carrot Top Records' head honcho Patrick Monaghan by Steve Goulding. Monaghan loved the record and Reilly quickly agreed to let him put it out. Following the album's release, Reilly and her band played a few shows, mostly regional, but the plan now is to "start work on the next record soon and tour intermittently", as Reilly tells me. "Time seems to slip away at a faster pace here," Reilly tells me of New York. "It's good to be surrounded by people that can inspire you, my friends as well as the hordes of crazies." Recalling her work with Doug Easley, Reilly shares with me the most valuable lesson she learned while recording at his studio. "He said 'everybody is telling you how good you are, but you need to focus more.' I think the most important thing I learned from him was that it is equally as important to think about the structure of the song, than to just go by emotion...to think about the listener."